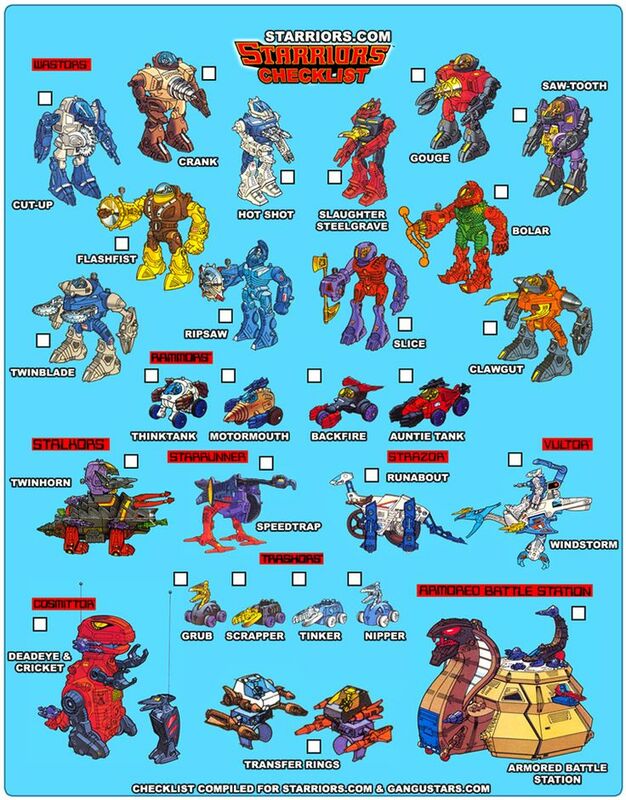 What was this toyline called? Back around 1987 I had this robot-like toy, with a green body and arms, red head. The head and arms were removable as far as I remember. One arm had an orange whip-like thing on that that rotated through a winding mechanism in the arm itself. Some of the robots were on a mission to find the human who created them, because he went into hiding after he created them. The rest of the robots were afraid and were trying to prevent those from finding the creator. Not sure if this was the full line, but something like this. Does anyone know what the line line was called? Sounds like Starriors from Tomy. Underrated line. lasted two years. Some of them were released in Europe in different colors as another series. The Marvel comics mini-series was good as toy-tie-ins go. After some global disaster, what was left of the entire human race went into slumber and left classes of robots to rebuild civilization and others to defend it. The military caste came to dominate the workers. Mankind became a legend, their place of hibernation lost to history. Last edited by Sean C; 02-10-2018 at 03:58 PM..
Looks like the one I had was called Bolar. Thank you! Too bad the forum is not letting me post a link. Couldn't remember the name, so I just looked it up with google. I think you may be talking about Bolar, of the Starriors line. There were so very many of them. Some looked cool, especially Bolar. lol I type slowly...apparently...Glad you found it! Starriors were perpetually on closeout at my local Kay-Bees for years...from like the mid 80s to well into the 90s. They couldn't give those things away, even with a 99 cents price tag lol. When I mentioned that the figs were plentiful, the sheer preponderance of Starriors on pegs circa the 80's-90's definitely played a role in my statement. I think Tomy may have undermined their own efforts by creating a cheaper more accessible (nothing to assemble with Starriors) alternative to Zoids. The Starriors, despite having some cool designs, paled in comparison to their mechanized forerunners. Simultaneously, the glut of Starriors gave frugal parents a far less expensive option when children clamored and pointed at the more sophisticated Zoids.